The Philippines is one of the best places to dive, according to scuba divers. In fact, they come to the Philippines from all over the world and find enjoyment and fulfillment in diving for business or pleasure. Whether it's hunting for beautiful coral or doing marine biology research, the waters of the Philippines have much to offer. #1 - Tubbataha, Sulu Sea - located southwest of Puerto Princesa City in Palawan province, offers experienced divers a close look at white and black tip reef sharks, whale sharks, mantas, turtles and hammerheads. The Sulu Sea is rough and the current strong, so this dive site is only for the experts. Divers can get there by flying to Puerto Princesa and then by boat. #2 - Anilao, Batangas - is located two hours from Manila (by car) and would be a good choice for new scuba divers, including scuba diving classes. After that, it's in the water to search for colorful fish, turtles, sharks and barracuda, and even allusive pygmy seahorses, and nudibranchs that can't be missed due to their extraordinarily bright colors. #3 - Coron, Palawan - is perfect for history buffs. Divers can explore the wrecks of World War II Japanese supply ships. At Barracuda Lake, divers can swim with the, you guessed it, barracudas. Gunters Cathedral is one of the most popular dive sites in Palawan. It's like a cave in the bottom of the sea with a skylight, thus the name cathedral. It's an unreal experience. Divers can fly to Coron and book a dive through any one of the many resorts and dive operations. #4 - Apo Reef, Mindoro - is located in the Apo Reef Natural Park between Mindoro and Palawan provinces. It has a coral reef that is the second largest in the world, clear water, corals, colorful fish, turtles, schools of jacks, large tuna and manta rays. This dive site is for the adventurous only. The best way to reach this dive site is to fly into San Jose, Mindoro, then by boat which can be booked at any of the resorts. #5 - Apo Island - is located off Dumaguete and is a marine reserve that is used as a laboratory by Silliman University to teach marine biology. So, you can expect to see many fish. 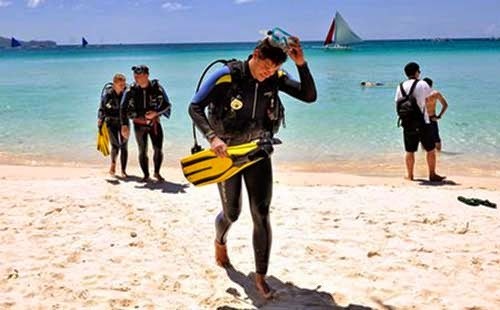 Divers can explore shallow waters or go deeper in areas like Mamsa Point Dauin and Coconut Point. Or divers can swim with whale sharks in Donsol, Sorsogon province. Visitors can fly to Dumaguete where they can also explore the city. A summer trip is recommended.